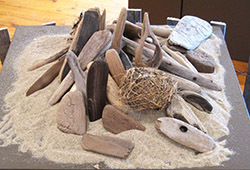 This year's all-new exhibition at the Saugatuck-Douglas Historical Society Museum, opening for the season on Memorial Day weekend, Sunday, May 26, Noon to 4pm, offers a multifaceted look at the Kalamazoo River duneland and its archeological, historical, environmental, social and recreational significance, in contrasting tales of change and permanence. 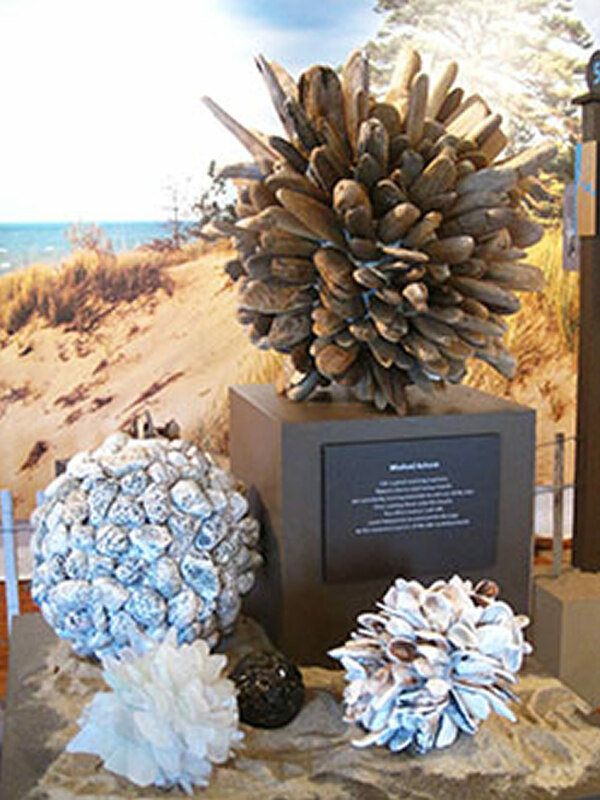 Titled "Dunelands: Footprints on the Sand", the exhibition celebrates our piece of the world's largest freshwater dunes system in the world, according to Museum Curator Dr. James Schmiechen. "It's a marvelous collaboration of restless beaches, rolling forests and ravines, hidden streams, ponds and marshland habitats," he says. "This exhibition tells of how they came to be, how human activity has changed them and how people have changed in response to them, while giving special attention to historic sites scattered across the area and how history has set the stage for today's vibrant local community." Researched and written by Schmiechen, and designed by Society volunteers Judy Hillman and Sally Winthers, the exhibition pulls together an array of photographs, artifacts and stories, set before a sweeping 50 x 10ft. mural dunescape captured by local photographer James Cook, intended to visually transport the viewer outdoors. Informative wall panels weave text and graphics together to view the dunes from three different perspectives: The Preservationist's Notebook surveys 12 nearby "critical dune" sites with an eye toward "best use" protection of the natural environment while allowing appropriate public access; The Photographer's Notebook presents aerial views of local shoreline geography by Chicago photographer Bill Werme, documenting changes resulting from both natural and human causes; The Archeologist & Historian's Notebook, recalls the late 1800s "lumber rush" that disregarded nature, creating millionaires but sentencing the village of Singapore to its ultimate burial by shifting dunes. 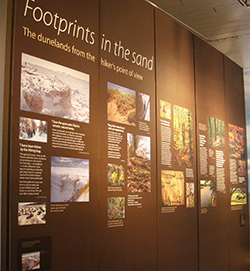 Another series of wall panels presents a compilation of photos taken along dune trails, accompanied by hiker quotes revealing personal impressions and expressing thoughts inspired by their duneland experiences. 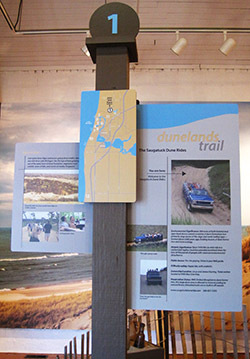 Centerpiece of the exhibition is a simulated "Dunelands Trail", marked by trail-stop signposts showing and describing a variety of sites encountered on an imagined hike through the dunes, including: Dune Rides; Goshorn Lake & Dune; New Harbor & Basin; Old Harbor & Lighthouse; Fishtown; Oxbow Art School & Lagoon; Pier Cove; The Oval; Mt. Baldhead; and Lake Shore Chapel. Hovering above it all is "Beachcomber's Folly" a whimsical-while-thought-provoking hanging sculpture by Saugatuck artist Ted Reyda. The colorful composition was meticulously assembled from thousands of items that were washed up on local beaches and collected by Reyda over more than 20 years. Below, Reyda transforms other types of manmade flotsam into spherical standing artworks. In their own playful way, all serve to raise serious questions about human carelessness regarding our environment and disregard for protecting nature's gifts. Museum guests will find themselves silently drawn to interact with Reyda's art by identifying its components...sometimes obvious, sometimes not. 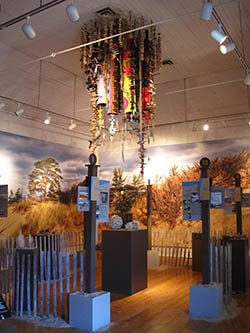 Augmenting the Historical Society's exhibits is a video display created by the Saugatuck High School students of art teacher Christa Wise, inspired by the work of British sculptor Andy Goldsworthy, known for combining natural materials such as twigs, stone, thorns, mud and pinecones into temporary in-situ constructions that weather the elements and return to nature. After watching "Rivers and Tides", a 2001 documentary featuring Goldsworthy at work, the class set out to Oval Beach and the dunes to create site-specific sculpture and land-art using whatever they found. Their short video, in the style of "Rivers and Tides", documents the students' efforts to follow in Goldsworthy's footsteps, in the process discovering (in the words of one student) "how difficult it is to even begin to approach the quality of his work".